I have only read one of the Lizzy and Diesel novels, but I have been a fan of Janet Evanovich since her first Stephanie Plum book. And, when a character named Diesel showed up in Stephanie’s world and then moved to a series of his own, I thought it was important to follow him. Random House Publishing Group offered an e-galley version of the book in exchange for my honest comments. Lizzy Tucker, an amazing baker in Massachusetts, falls into a centuries old mystery, wherein she and the mysterious Diesel are enlisted to find a pirate treasure. Along the way, friends get pulled into the mix, family members get kidnapped and Lizzy gets a lucrative book/product deal. However, when the two realize the persons (and forces) on the opposing side of the quest can turn friend to foe, they have to rely on the help of foes in order to help them save the day. However, when the tide turns and the pirate treasure ends up the enemy’s hands (along with Lizzy, herself), will the forces of good be able to thrive, or is Lizzy dead in the water? I really enjoyed this novel. Janet Evanovich and Phoef Sutton have a good writing flow. Having been so familiar with Evanovich’s work (I’ve read her books since 1994), it was difficult at times to tell if Phoef was writing. 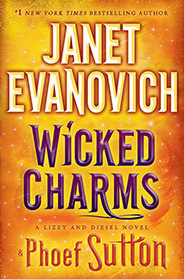 However, the magical elements are a different, but very cool addition to Evanovich’s writing. I loved the idea of a Glo spell going wrong (it is kind of her thing) and Glo, as a sidekick, seems a little bit like Lula from the Plum series. I really enjoyed some of the historical aspects of the city they are in, as well as the otherworldly parts of the story. It is hard to believe that someone can just appear when needed, and that they have a monkey that likes to flip people the finger, but it was easy for me as a reader to feel like I was in that world, especially considering the supernatural elements. And Diesel, well, he’s just awesome. I recommend Wicked Charms for people interested in a funny mystery, as well as people who need to escape a little bit (and what novel isn’t an escape?). You can pick it up in your favorite format from your favorite retailer today!